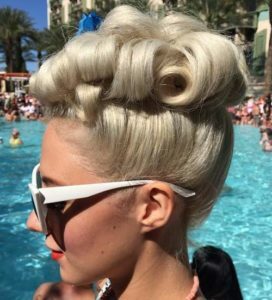 Pin curls were a hair styling staple of the 1940s and 1950s, and there is no better way to create the look than to mimic the technique they used back then. After all when something isn’t broke, there is no need to fix it. 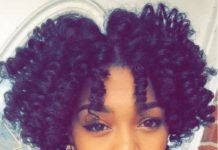 The technique itself is relatively simple, but it does take some practice to master and get those perfect defined curls. So, lets first start with the basics. 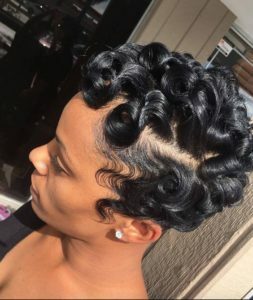 A pin curl is a strand of hair that has been rolled around in a loop from the tip to the roots, in concentric rings that lie inside each other. The ends are tucked into the center and the curl is pinned into place with hair grips. 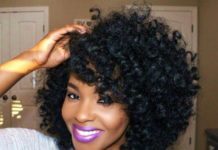 You start with wet hair and remove the grips once the hair is dry, and beautiful corkscrew curls will be revealed. 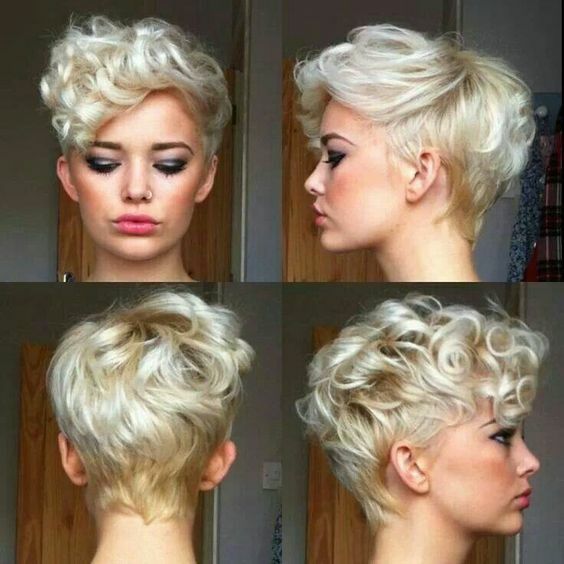 You can choose the direction of the curls and how the curls will fall if you just take in mind if you want a parting and where you would like it to be. Once your curls have dried you can remove the pins and instead of letting the hair loose, use some concealed hair grips to hold the curls in place, to create a vintage up-do. If you are tempted to create your own vintage styles at home, we have an easy pin curl tutorial for you, so you can get practicing. Starting with towel-dried hair, part the hair and clip away sections you are not working on. Section an inch square of hair and apply a fine mist of setting spray or a small amount of curl cream. Be sure that the loops are wrapped inside one another and don’t twist the hair as you might end up with frizzy curls. Tuck the ends of the hair into the curl and secure on the open side i.e. opposite the roots of the hair. Allow the hair to dry. You can apply heat to the curls, just make sure they have cooled fully before removing the bobby pins. 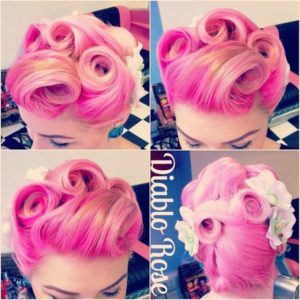 Style your pin curls however you like. There are two types of pin curl. The first is the flat curl, which are curls that are pinned flat to the scalp. 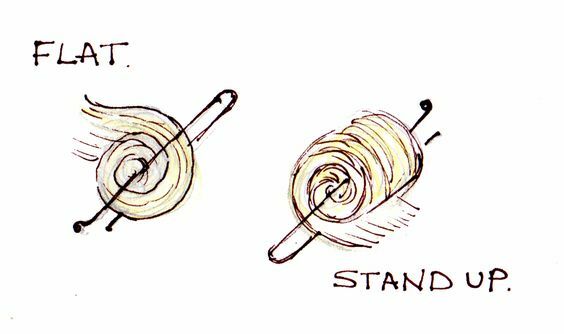 The second is the standing pin curl (also known as a barrel pin curl) that are pinned to stand away from the scalp on an upright position. Christina Aguilera is the queen of the retro hairstyle. 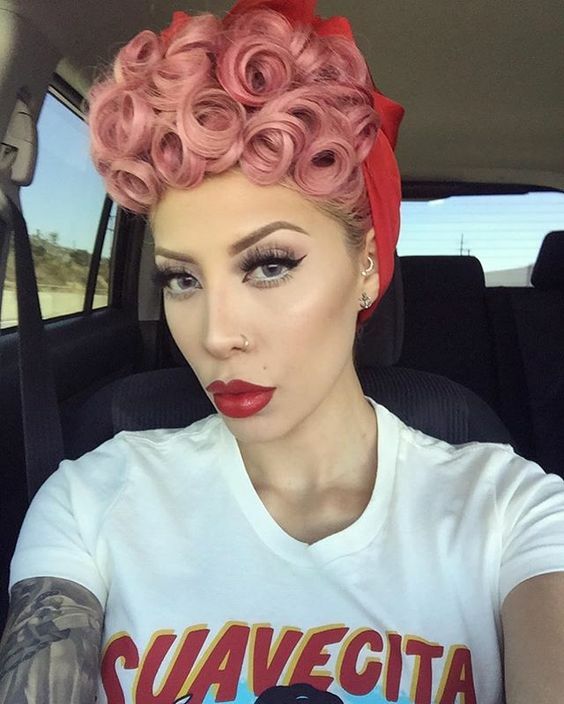 She has nailed the pin-up look and no better than will her Marilyn Monroe-inspired platinum pin curl bob. Instead of combing through the curls to create more of a wave, she has kept her pin curls tight, defined and bouncy. Incredibly chic, especially when paired with a knock out red lip. A bold colour choice is a great way to modernise your retro hairstyle, whilst also creating a unique look. 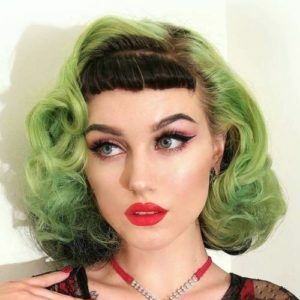 The pastel green shade of these pin curls is stunning, and it stands out further thanks to the contrasting black shade of the blunt bangs and the roots. Such a stunning vintage look. Standing pin curls always look beautiful when pretty much left untouched. They have such a wonderful shape as evidenced in this classic 1940s hairstyle. 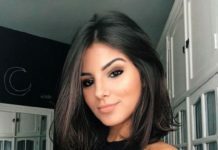 The side-part gives some structure to the style, but a good mist of a firm hold hairspray should be applied to keep everything in place all day long. 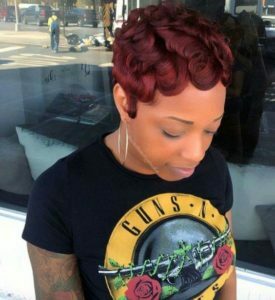 How gorgeous is this retro inspired red pixie! If you have red hair, consider creating these round soft pin curls! 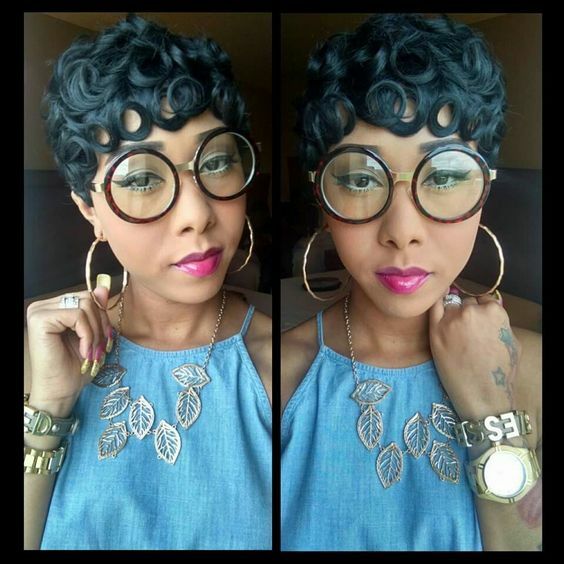 This polished pin curl up do is so sophisticated and chic. It would be perfect for a wedding or any other special occasion as it modernised with contemporary make up and some loose tendrils if you choose. Create some faux bangs, by taking the lengths around the hairline and styling into a large barrel roll and pin into place. Taking inspiration from the remarkable factory girls of the 1940s, this vintage hairstyle features pin curls secured in place with bobby pins (also known as kirby grips). The then trademark paisley bandana tied around and secured in a bow at the top of the head. The look may have originated in the 1940s, but it will never go out of style. 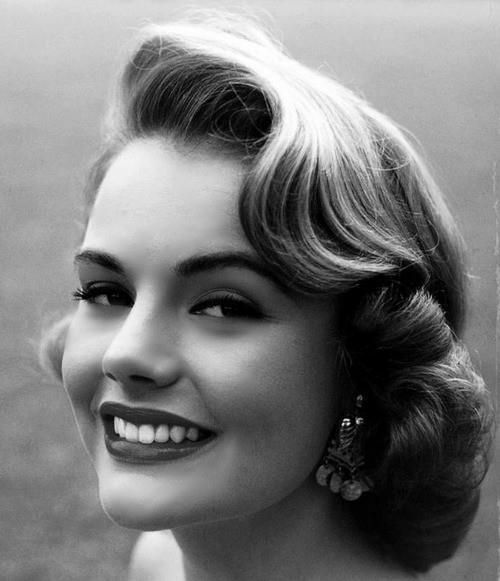 Smoothed down hair with brushed out pin curls right around the nape of the neck is such a classic vintage style. It is also a great way to add volume to thinner hair, as pin curls give great body when teased out just right. It is important not to comb through the set curls too much, as there is a fine line between fluffy and frizzy. You may need to head to a professional vintage hair stylist for this complicated pin curl up-do, but it will surely be worth it. The look is incredibly sleek, with the curls being pinned with expert precision. The pin curls have great definition thanks to the two-tone colours of the hair, don’t you think? It is amazing that such a vintage styling technique has managed to create this almost futuristic hairstyle. 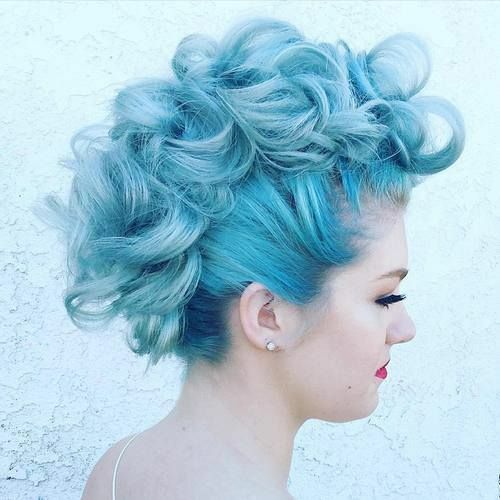 Pastel blue locks have been styles into bouncy pin curls, which have been secured with invisible grips to create a faux hawk effect. Such a high impact look. Could this vintage bob be any more perfect? Reminiscent of the glamorous Flapper Girls of the 1920s the icy blonde bob features an extreme side parting with elegant finger waves which flow beautifully into some combed out pin curls. Lovely! Channel you inner Mae West with blonde bombshell curls teams with a red lip and perfect black eyeliner flick. Vintage styles work so well with accessories, such as this beautiful red flower, whilst also adding an extra touch of the vintage. Everyday glamour at its best. 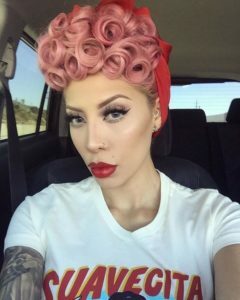 This short pink hair has been given a completely new look, by styling into pin curls and then pinning them into place on the top of the head. The look is fun, playful and so full of movement – a classic pin-up look from the 1940s and 50s that looks just as good today as it did 70 years ago. The poodle style (pin curls piled up on the top of the head towards the hairline) was made popular by Lucille Ball in the 1940s and 1950s, and it is still popular amongst vintage fans today. Just take a look at this contemporary take on the poodle style – the dusky pink shade is modern, yet the headscarf pays homage to the factory girls of the forties. A perfect blend of the modern and the vintage. 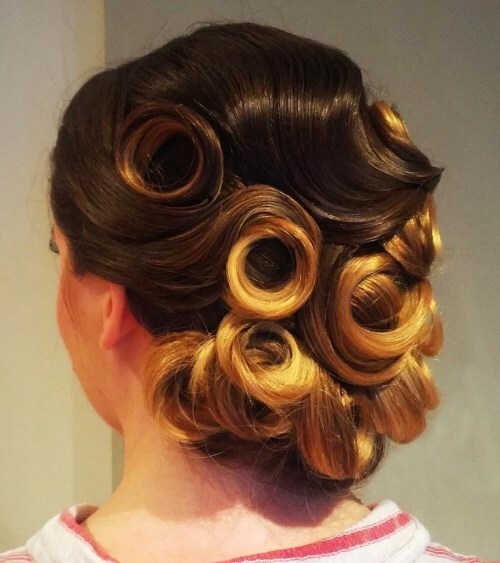 These barrel pin curls have created such a unique vintage up-do. The upright curls have been pinned right on the top of the head for great height, and curls range from the large at the back to small in the front for a look that is perfectly proportioned. A texturising spray will help to provide grip to your hair to keep your curls in place all day, as well as give a chic matte finish. With pin curls, you don’t need to go for a full vintage hairstyle, you can incorporate them into your contemporary style too. 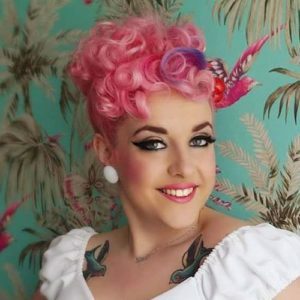 Just take a look at this modern pixie, which has kept the natural texture at the back, with some pin curls in the longer lengths at the front and down one side. Youthful and effortless. 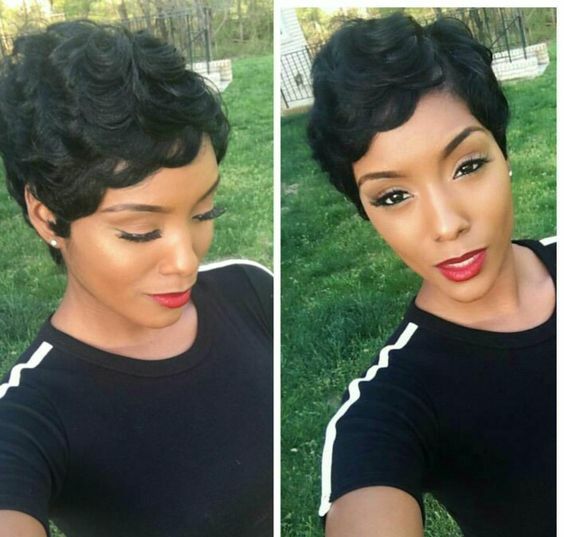 Pin curls on really short hair can be a real show stopper as this cropped pixie cut shows. 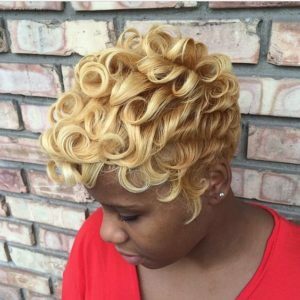 The curls have been left defined and smoothed flat for a look that is sleek and chic. The fiery colour palette makes this look even more stunning, transforming it from vintage to editorial. 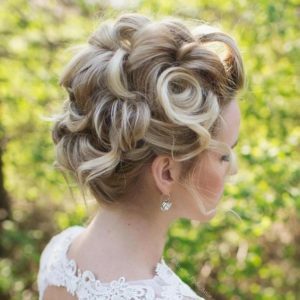 The bridal up-do for short hair has the perfect mixture of barrel and flat pin curls, which creates an elegant and carefree style, perfect for making a bride feel beautiful.The style is slightly undone, with loose tendrils, which makes the look appear fresh and contemporary. 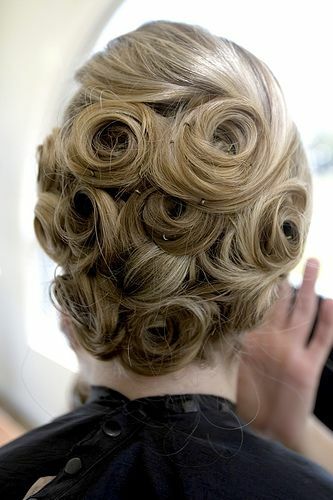 This style featured voluminous pin curls and finger waves. Remember, you can create beautiful flapper inspired pin curls, without the use of heat that can damaging your natural pattern. 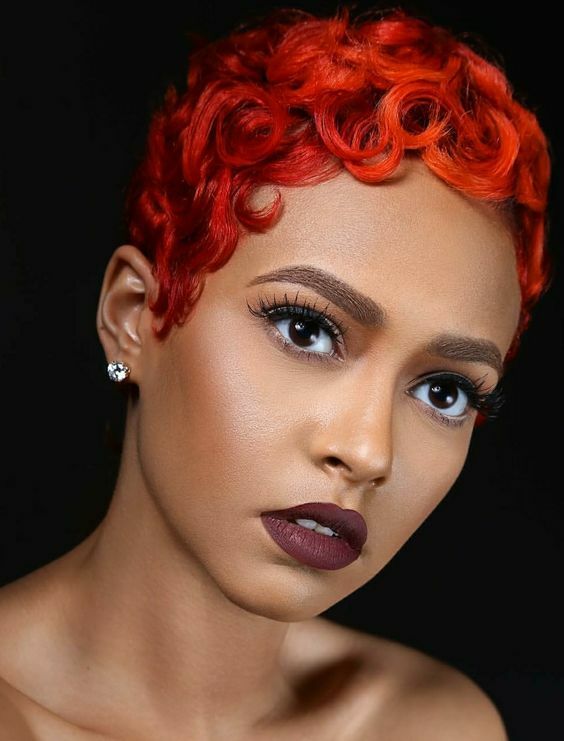 The cascading pin curls around the hairline of this bob are just stunning and this with the coiffed bangs make this a great style for round faces. 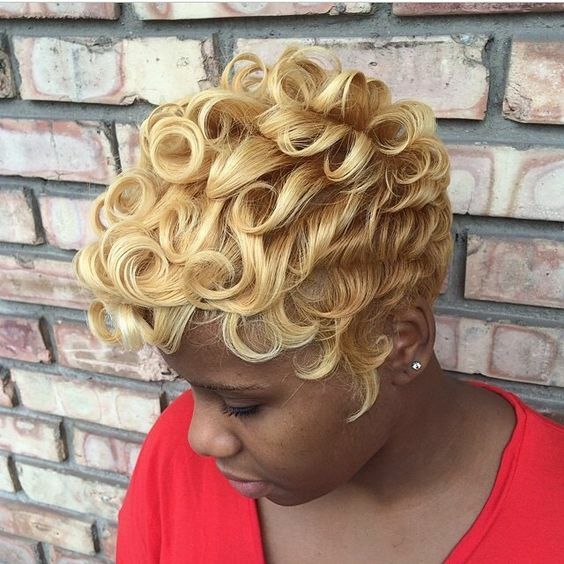 Furthermore, the honey blonde shade of this bob is to die for, don’t you think? A great alternative to platinum blonde, which can wash out some fair skin tones. Jazz up your pixie haircut with defined pin curls at the back and the fronts! 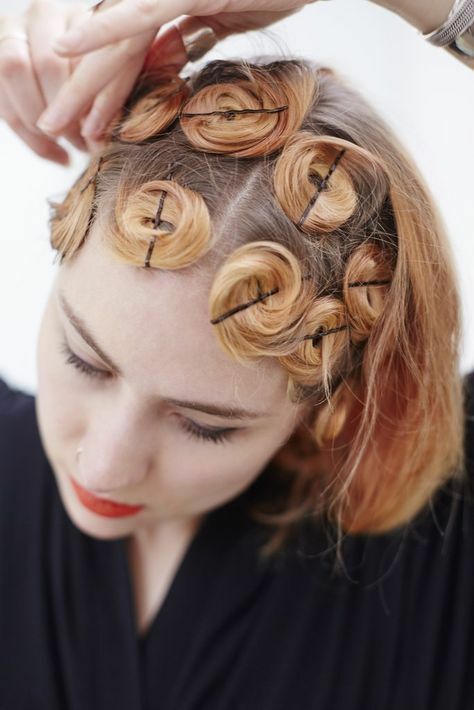 You don’t need to go all over with the pin curls. 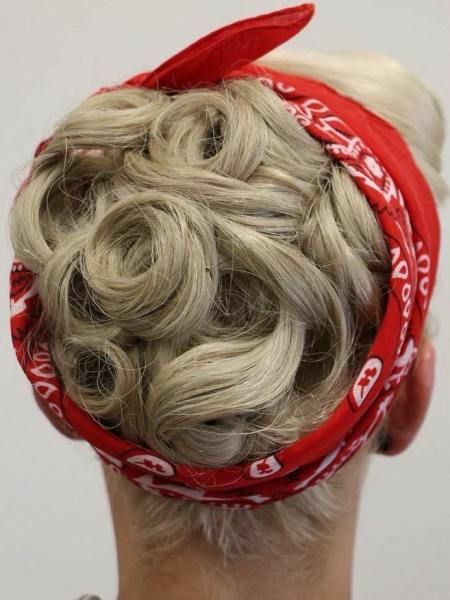 Just a few nicely places curls can be the perfect addition to an up-do, like with this beautiful Victory Roll style. The pin curls being perfect mirror images of each other must have been hard to achieve, but it is surely worth the effort. 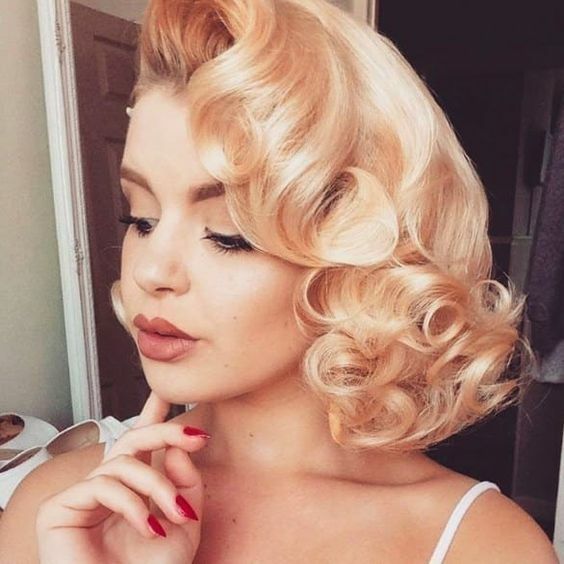 Pin curls are not just a way to add a touch of the vintage into your hairstyle, they are also a great way to add volume to finer hair. 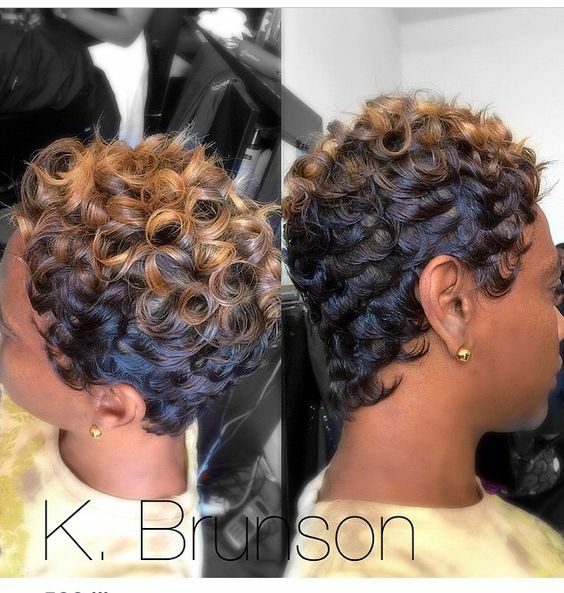 This graduated bob has so much body, life and movement thanks to pin curls. If your hair is super short, you can go for a more subtle look with loose wavy pin curls. Arguably, pin curls look their best when they styled in the classic vintage way – combed through with fingertips and pinned around the nape of the neck. The two-tone colour of the hair really helps to define the curls as well as giving extra depth. The peekaboo of red through the platinum blonde is just stunning and is matched perfectly to the model’s red lip. Gorgeous! Ombre still remains a super popular hair trend and in this short style, the ombre color helps define and pop your curls. 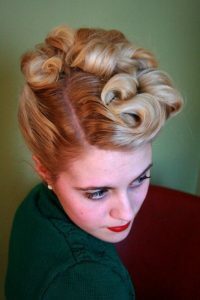 Pin curls can be are either forward or reversed. In this full on pin curl style the curls are created in counterlockwise direction and the defined culls at the front autifully frames the face.